Do you agree with this comment? If not, what kind of difficulties do you think Rohani will be facing domestically in seeking moderate U.S. policies? A (T.O’D. ): The appointment of Mohammed Javad Zarif as President Rohani’s new foreign minister is a very positive step for negotiations with the USA. Zarif, in his time as Iranian ambassador to the UN in New York City (August 2002 – July 2007) was very active meeting and getting to know Americans and even opposition Iranians who live in the USA.. Many opposition Iranians in the USA considered him a more reasonable and liberal man than most of the leaders in Tehran. In my opinion, the subjective conditions for a major breakthrough in US-Iran relations are improving. That is, both the Obama administration and the new Iranian president genuinely would prefer to resolve the nuclear confrontation via reasonable concessions and a negotiated settlement. The severe oil and financial sanctions that the USA, EU and UN have imposed are greatly damaging the Iranian economy. The Iranian people elected Rohani because of his “moderate” promises to resolve the US-Iran dispute and improve their economic conditions. The Supreme Leader cannot ignore this strong public opinion. However, the objective conditions remain difficult for a negotiated settlement to the US-Iran dispute. For the USA: When oil sanctions are finally removed, Iran will become a petroleum-producing powerhouse, with great influence in markets. It will also have potential for a strong military in the Persian Gulf, where over 50% of the world’s oil reserves are located. The USA and EU today do not trust a strong Iran and will require guarantees that Iran will never try to dominate its oil-rich neighbors. The USA is the protector of Saudi Arabia and other local states, and the USA remembers when Hussein of Iraq invaded Kuwait. For Iran: To end its nuclear program, Iran wants guarantees that the USA will never attempt “regime change”, and will respect Iran’s desire to be a strong regional power that is allowed to project power in the Persian Gulf. Iran does not want to be a protectorate of the USA; rather, it wants to protect its own national interests. While the subjective conditions are improving, strong differences in national interests — objective differences — remain. It will require very mature and reasonable negotiators on both sides, and could easily fail, leading to a conflict. Almaty Talks: Despite several meetings … the end result is still pending. Sanlian Life 17April 13, Beijing. Sanlian Lifeweek: We are paying attention to Iran’s newly elected President Hassan Rouhani. Before the election, he is not a very famous person. We almost know nothing about him. We want to know his experiences, his political ideals, and his impact on the domestic and diplomatic policy of Iran. (1. QUESTION1 Sanlian: Hassan Rouhani defeated his rival conservative candidates in Iran’s 2013 presidential election by gaining 50.2 percent of the votes. Is it an unexpected result, a successful Campaign strategy of the reformist, or else? (ANSWER TWO’D): Although Hassan Rouhani is not well known outside Iran, he is well-known inside the country, and, because of his important positions for many years as a nuclear negotiator and National Security Adviser, he is of course well-known to foreign governments. Yes, the election of Hassan Rouhani was a surprise. During the campaign, in the debates between the candidates on national Iranian television, Mr. Rouhani strongly challenged other candidates and was critical of Iran’s nuclear policy, its foreign policy and the treatment of student demonstrations. He has also promised to improve Iran’s economic situation, which is very bad at present due to UN, USA and EU sanctions. His positions got the attention of Iranian voters who are unhappy with the direction of their leaders, and he won the election. The most important lesson from this is that the a large section of the people of Iran are unhappy with their government’s policies and desire a more moderate foreign policy, nuclear policy and towards domestic protesters. (2. QUESTION Sanlian): Hassan Rouhani is known as a negotiator over the Iran’s nuclear issue with the West (2003- 2005). How do we evaluate Iran’s negotiation strategies during this period? Which kind of roles did Hassan Rouhani play? And will this experience effect the nuclear negotiation strategies in the future? (ANSWER TWO’D): Hassan Rouhani has much experience with the nuclear issue, and much experience in negotiating with foreign powers such as the USA and the EU. He made some important agreements with the EU leaders as a negotiator. However, the president of Iran does not decide Iran’s nuclear power. The Supreme Leader, Khamenei, decides. If Khamenei does not give Rouhani permission to change Iran’s positions and negotiate an agreement with the USA and EU, he will not be able to. (3. QUESTION Sanlian:. Hassan Rouhani said he was moderate. How should we understand “moderate”, a compromise between the reformists and the conservatives? Should the change of the relationship between Iran and the states be anticipated? (ANSWER TWO’D): Rouhani is “moderate” only in comparison to the other candidates who were all very much in agreement with all the present policies of Iran and its Supreme Leader. Other candidates, known for many years for their criticism of Khamenei’s policies were banned from running for election. Rouhani is known to be close to former-president Rafsanjani. Rafsanjani has always represented the interests of a section of Iranian business, that supports a rather liberal opening of the economy but maintaining strict religious and social policies. Rouhani has always made clear his loyalty to the Supreme Leader, Khamenei, and was appointed by Khamenei to his important National Security and nuclear negotiator posts. The US and EU may make unilateral concessions to show good faith and test whether the Supreme Leader will allow Rouhani to negotiate an end to the nuclear crisis. This is what the USA did in 1997, after a much more liberal-cleric, Khatami, was elected president. However, any such opening today would be much briefer if Iran does not quickly make significant concessions in return. Obama and his new secretaries of State and Defense, plus his new National Security Adviser prefer a negotiated solution with Iran. However, failing significant progress this year, geostrategic considerations will impel much harsher US-EU sanctions to prevent Iran’s nuclear program from rapidly advancing. China and Russia will likely not block the US and EU, as they also oppose Iran getting a nuclear weapon, as the Gulf Region is the most important oil-producing region for the global oil market, and like the USA, they fear a nuclear Iran would have too much influence over the other important oil producing states around the Persian Gulf. (4. QUESTION Sanlian) as a newly elected President, what is the biggest difficulty or problem for Hassan Rouhani at first? (ANSWER TWO’D):First, Iran’s economy is in very serious trouble, mainly due to sanctions. Rouhani must find out quickly if the Supreme Leader will allow him to make nuclear concessions to the USA and EU to reduce sanctions. It is not clear if the Supreme Leader will agree; but the Supreme Leader must be very concerned after so many people voted for Rouhani in support of Rouhani criticisms of Iran’s present policies. Also, many people predict that a new type of protests could occur in Iran. Many working and poor people are very upset about the economic difficulties they face while they see many of the old Islamic revolutionary activists now enjoying great riches and corruption. So, instead of the mostly middle class protests by the Green Movement that took place previously, many Iranians predict that the popular masses – the working class and poor – could suddenly come to the street and be joined by the Green Movement’s middle class. This would be very difficult for the Islamic State to cope with. The example of the protests in neighboring Turkey might also encourage protests. Secondly, there is the danger of a regional conflict developing out of Sunni-Shiia tensions over the Syrian civil war, and over Sunni discontent with the pro-Iranian Shiia leadership of Iraq. Also, Turkey is opposed to Iran’s assistance for Assad. If Rouhani is not very careful, his country could be quickly involved in serious conflicts. = Lastly, here is the interview on Iranian-Egyptian relations. Both Morsi and Ahmadinejad have passed from the scene since I wrote this six months ago; but the future of Iran-Egypt relations are still germane. 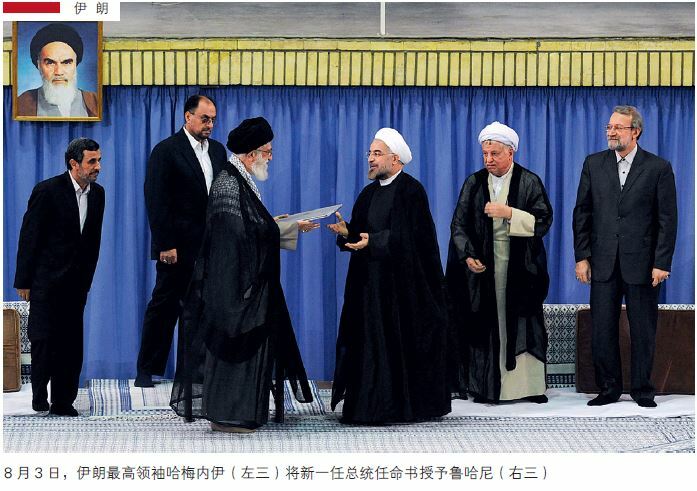 (3a) Chinese: 内贾德访问埃及：两国关系将全面解冻？or: “Ahmadinejad’s visit to Egypt: bilateral relations will be fully thawed?” See: P14-16观察_sanlian_lifeweek_china_iran_16feb13, second page. Syrian crisis?) And out of what reason did Mr. Morisi welcomed the visit? (1 ANSWER TWO’D): Ahmadinejad went to Cairo because the leadership of the Islamic Republic is becoming dangerously isolated. Iran is under unprecedentedly harsh international sanctions having deep economic and political effects, especially on revenues from its oil and gas sector. While the U.S. and E.U. have taken the lead in these sanctions, all Iran’s Arab neighbors are in agreement. Iran has only one ally in the Arab world, Syria. However, the “Arab Spring” popular revolutions, which have swept several dictators from power, including Mubarak of Egypt, has Syria’s Assad approaching the same fate. Iran’s other ally has been Hezbollah in Lebanon; however, there too Iran’s leverage in Lebanon has become limited. So, Ahmadinejad went to Cairo because Iran seeks to break out of the tightening ring of opposition in the region to its nuclear program. However, it is important to understand that the opposition to Iran’s nuclear program is really opposition to any ability of the present leadership of Iran to project military power of any type, whether nuclear or conventional, in the Persian Gulf. The Persian Gulf is the region of highest importance to the security of the global oil market, and Iran’s leadership is not trusted by the U.S., the EU, or by Iran’s Arab neighbors. All in all, Ahmadinejad had a difficult visit to Egypt. Iran’s government is opposed by many segments of Egyptian society. Progressive and liberal youth despise Ahmadinejad for supporting the dictator Assad and because Ahmadinejad is a radical rightist religious leader. Sunni radicals generally oppose him based on their sectarian hatred of Shiism. More generally, Egypt is still an ally of the U.S., deeply dependent on Washington for economic and military assistance, and Egypt has historically vied with Saudi Arabia for leadership of the Arab world. Any alliance with Iran would sacrifice both these positions and bring extreme pressure on Egypt from the U.S., Europe and most Arab states. On the one hand, since the overthrow of Mubarak, who had completely broken relations with Iran, Egypt is searching to find its place in today’s heated Middle East geopolitical landscape. It is normal that Egypt and Iran have basic relations; but there is little interest from any Egyptian leader, be it Morisi of the Muslim Brotherhood or any secular liberal leader, to bloc with Iran. By inviting Ahmadinejad to Egypt, Morsi presents a face of having some independence from the U.S., but also presents itself as a potential regional power broker, challenging Saudi Arabia for this position. (2 QUESTION Sanlian Lifeweek): To what extent do you think the visit will change the relations between two countries? (2 ANSWER TWO’D) This visit will make hardly any difference. It might give some small prestige to Ahmadinejad at home, in Iran, within the very intense sectarian political infighting between his faction and that of Larinjani and of the Supreme Leader. For Morsi, he is deeply involved, as are all Egyptians, in the internal political struggles over whether Egypt will be democratized or be a Sunni religious-authoritarian state. Egypt has, for now, little strength or time for attention for these regional geopolitical matters. This entry was posted in China, international relations, Iran nuclear, Iran sanctions, negotiations, Obama, Oil supply, OPEC, P5+1, Persian Gulf, Rouhani, South China Sea, The USA, Uncategorized and tagged Hassan Rouhani, Iran, Middle East, Persian Gulf, Rouhani, Sanlian Lifeweek, South China Sea, supreme leader ayatollah ali khamenei, United States, US-Iran. Bookmark the permalink.